So far in RxTrace I have explored the possible implications of the California pedigree law on drug repackagers, 3PLs, VMI relationships and, of course wholesale distributors. Now let’s take a closer look at the murky world of the contract manufacturing organization (CMO). I call this world “murky” only because you have to look very carefully at the relationship between a CMO and the contracting manufacturer to fully understand how the pedigree law might be applied. And even then you are going to have to check with the California Board of Pharmacy because the law is so confusing in this area. First of all, I am not a lawyer. I cannot give you legal advice. I only read the law and the associated regulations and other material and provide you with my uneducated thoughts on what it all might mean. I am not qualified to tell you how to interpret the law and I have not confirmed any of this with the Board of Pharmacy. That’s your job. So be careful. Before you take any action that might affect your business, please check with your lawyer and/or the California Board of Pharmacy for official interpretations. (1) ‘Manufacturer’ means and includes every person who prepares, derives, produces, compounds, or repackages any drug or device except a pharmacy that manufactures on the immediate premises where the drug or device is sold to the ultimate consumer. (2) Notwithstanding paragraph (1), ‘manufacturer’ shall not mean a pharmacy compounding a drug for parenteral therapy, pursuant to a prescription, for delivery to another pharmacy for the purpose of delivering or administering the drug to the patient or patients named in the prescription, provided that neither the components for the drug nor the drug are compounded, fabricated, packaged, or otherwise prepared prior to receipt of the prescription. (3) Notwithstanding paragraph (1), ‘manufacturer’ shall not mean a pharmacy that, at a patient’s request, repackages a drug previously dispensed to the patient, or to the patient’s agent, pursuant to a prescription. By the way, the references in this definition to sections 4034 and the various subsections under 4163 are all pedigree-related sections, so subsection (b) of this definition appears to be aimed squarely at defining who is a “manufacturer” with respect to pedigrees. And that covers a lot of entities in the U.S. pharma supply chain. WHENEVER A CMO IS INVOLVED, ARE THEY EXEMPT FROM PASSING PEDIGREES? In the U.S. pharma supply chain the use of CMOs as part of the manufacturing process is widespread, deep-rooted and very mature so it is important to figure out how these relationships might impact the generation and passing of electronic pedigrees. A contract manufacturer is a manufacturer, and it is common knowledge that pedigrees in California must start with the manufacturer (after January 1, 2015 and 2016), but we also know that pedigrees in California are intended to show only changes in ownership. So in the simple case, if a “manufacturer” issues a contract to a CMO—also a “manufacturer”—to produce their drug, and the CMO subsequently ships the drug to the “manufacturer” in fulfillment of that contract, which “manufacturer” needs to start the pedigree? Look at the ownership. In this case, the CMO does not appear to own the drugs they are making since they are simply fulfilling an outsourced manufacturing function. In this case it appears that the ownership starts with the “manufacturer” who issued the original contract to the CMO. That’s what it appears like to me in this simple example, but check with your lawyer and/or the Board of Pharmacy to confirm. Figure 1. 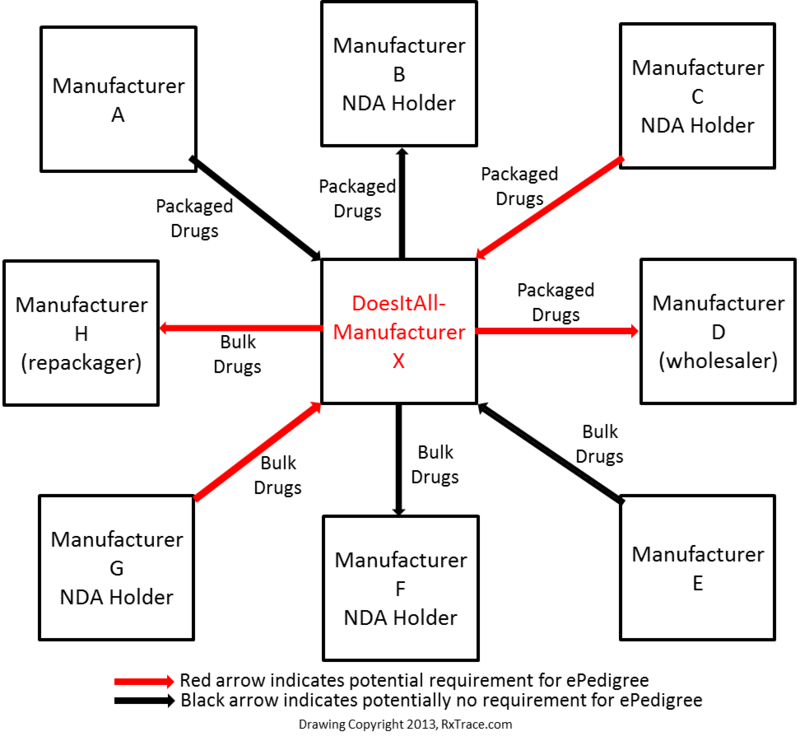 Manufacturer A is probably acting as a contract manufacturer/packager on behalf of the NDA holder, manufacturer B. Click image to enlarge. Figure 1 is a drawing of this simple case. Manufacturer B is the FDA New Drug Application (NDA) holder (or an Abbreviated New Drug Application, ANDA holder for generic drugs) and they issue a contract to manufacturer A to produce finished packaged drugs to their specification on their behalf. B makes a payment to A for contract services rendered under the contract, but A never owns the drugs, so, according to that logic, B should probably start the pedigrees when they ship to downstream trading partners. The shipment from A to B would apparently not need to be reflected on those pedigrees because there was no change of ownership, but even in this simple, common business arrangement, I suggest that you confirm this interpretation with your lawyer and/or the Board of Pharmacy. Figure 2. Manufacturer D appears to be acting as an exclusive distributor on behalf of manufacturer C. Click image to enlarge. Figure 2 shows a subtly different situation. It looks a lot like Figure 1, but in this case, manufacturer C is the NDA holder. They have an exclusive contract with manufacturer D, a well-known NDA holder and maker of other drugs, to supply them with finished packaged drugs with D’s name on the label. Just like in the first case above, D makes a payment to C, but this time, because C is the NDA holder, D is apparently buying the packaged drugs. In this case, manufacturer D is apparently filling the role of an exclusive distributor of C’s drugs with the label indicating that the drugs are “distributed by” D.
Who starts the pedigree in this instance? It appears to me that C would need to start the pedigrees and D would need to be licensed by the California Board of Pharmacy as a wholesale distributor if any of their downstream customers are within the State of California, but check with the proper authorities to confirm. If true, then D would need to update the pedigrees that were started by C to reflect their receipt and their sale, just like any other wholesale distributor. Figure 3. Manufacturer E appears to be acting as a contract manufacturer of bulk drugs on behalf of manufacturer F. Click the image to enlarge. Figure 3 shows another similar, but subtly different situation. In this case, manufacturer F is the NDA holder. They have a contract with manufacturer E to make their drugs, package them in bulk form and ship it to them. F then packages the drugs into finished goods form and sells them to downstream trading partners. In this case, my best guess is that F, being the NDA holder, is simply using E as a CMO, so just like the first case above, the bulk packages of drugs shipped from E to F would not need to be serialized or pedigreed since no ownership change has occurred and F is going to package the drugs for distribution into the supply chain. The pedigrees would be first created by F only when they sell to downstream trading partners. Again, check with the proper authorities to confirm. Figure 4. Surprise! Manufacturer H appears to be serving as a repackager, assuming they have bought the drugs outright from manufacturer G. Click the image to enlarge. Is this starting to look easy? Ok, now look at Figure 4 which shows a subtle variation on the previous case. The only difference in this case is that manufacturer G is now the NDA holder. Manufacturer H issues a purchase contract with manufacturer G to supply them with bulk pharmaceuticals. H then packages the drugs into finished good form and sells them to downstream trading partners. In this case, it appears to me that, because H is buying bulk drugs from the NDA holder, this now represents a change of ownership. Does the fact that the drugs are in bulk form make any difference? I don’t think so. In this case, G would probably need to serialize and pedigree their bulk containers and H, who is acting as, surprise, a repackager, would need to serialize their finished goods packages and update the incoming pedigrees to reflect the linkage to the serial numbers of the incoming bulk packages for their outgoing pedigrees (see “Repackaging Drugs Under A Serialization Regulation”). California licenses repackagers as wholesale distributors. This is my uneducated interpretation, please get an official interpretation from your lawyer and/or the Board of Pharmacy. BUT THESE ARE ALL “MANUFACTURERS”. WHY ARE SOME TREATED AS WHOLESALERS? I have highlighted the key language that implies that a pedigree must include information regarding transactions resulting in a change of ownership where a manufacturer acquires a drug through a purchase. See if your lawyer agrees with this interpretation. I purposely called all of the entities in my drawings above “manufacturers”. The reason is that so many companies that most of us recognize as drug manufacturers actually fulfill all of these roles. More times that you would expect, a single company can fill more than one of these roles—from A to H—for different products, all at the same time. You know these companies as “a drug manufacturer” and I know them as “a drug manufacturer”, and they think of themselves as “a drug manufacturer”, but for different products, they may actually be filling the role of an exclusive distributor, a CMO or a repackager. Each of these would be treated differently under the California law with respect to pedigree origination and updating. Figure 5. Manufacturer X “DoesItAll”. For different products that they act as the original manufacturer, a CMO, a CMO/CPO, a wholesale distributor and a repackager. Their serialization and pedigree management is going to be complex. Click image to enlarge. A to X. For these products, X is the NDA holder so A appears to be serving as a CMO/CPO under contract with X.
X to B. For these products, B is the NDA holder so X appears to be serving as a CMO/CPO under contract with B. C to X. For these products, C is the NDA holder so X appears to be serving as a wholesale distributor, perhaps an exclusive distributor or a 3PL. X to D. For these products, X is the NDA holder so D appears to be serving as a wholesale distributor, perhaps an exclusive distributor or a 3PL. E to X. For these products, X is the NDA holder so E appears to be serving as a CMO under contract with X.
X to F. For these products, F is the NDA holder so X appears to be serving as a CMO under contract with F.
G to X. For these products, G is the NDA holder so X appears to be serving as a repackager. X to H. For these products, X is the NDA holder so H appears to be serving as a repackager. The color of the arrow indicates my best guess at possible pedigree requirements, but again, check with your lawyer and/or the Board. This kind of “multiple personalities” in a company can make the handling of pedigrees a lot more complex within a single organization than many people may have expected when they look at the typical three-party supply chain diagram that shows a single manufacturer, a single wholesaler and a single pharmacy. For some products, the company will need to deal with serialization and ePedigree. For others, only serialization. And for others (like maybe E to X and X to F) maybe neither (depending on what the NDA holder does next with the bulk product). Most companies won’t look as bad as Company X, but make sure you analyze all of your products and your CMO relationships carefully so that you understand your true obligation under the law. Time is running short. Oh, and, one more time, include your lawyer in the analysis, and confirm your understanding with the Board of Pharmacy. Virginia Herold, the Executive Officer of the California Board of Pharmacy, discussed many of these situations during the June 28 Webinar with Brian Daleiden of TraceLink. Get ahold of the transcript of that discussion (the video is pretty long), it was very enlightening. COMING UP, MORE STUFF TO DO AND WRITE ABOUT! I’m going to skip my weekly essay next week so I can celebrate Labor Day with family. September is going to be a busy month with conferences and meetings every week, extending into October too. And, some people are expecting the Congress to act quickly on some unknown unified track & trace bill on their return the week of the 9th. I’m skeptical, but I’ll be watching as close as my schedule allows. If anything does pass, I will to publish my take on it as soon as I can. Follow my Twitter feed for faster updates (but less analysis). The ideas behind the essay have been brewing for a long time. Believe it or not, I wrote the essay without any drawings, and then realized that it had to have drawings to make sense. A picture is worth a thousand words, but they also are very time-consuming to produce. I had to read this slowly twice, but i get it. Thanks for putting it out there. I have shared the link with my team here. Thanks for your comment. This subject was pretty tough to explain properly, but I think it is a very important topic for a lot of companies. Those companies may be surprised to discover that they have prepared for the California law for some of their products but not others. That could be a shocking revelation at the last minute. I hope none of my readers find themselves in that situation. Here is a reason pharmacies should have to hit the database of a manufacturer to decommission/authenticate a serial number with a prescription reducing medicare/medicaid fraud.